Controversial IDF officer Brig. Gen. Ofer Vinter becomes an aide to Defense Minister after years of being held back for promotion. 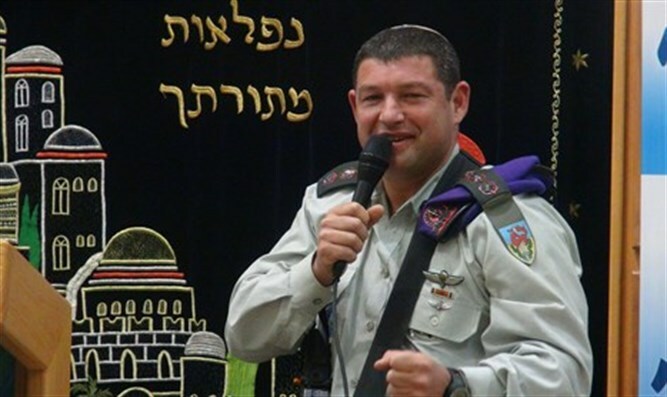 Prominent Religious Zionist Brigadier General Ofer Vinter was officially named as Defense Minister Avigdor Liberman's IDF secretary. Liberman had said in August that Vinter would be his military secretary back in July but the appointment only takes effect now. "I decided to appoint Brig. Gen. Ofer Winter as my military secretary. I'm sure that a high-quality and experienced officer like him will help me a lot," Liberman tweeted after announcing that he had named Vinter to be the bridge between the defense minister and the military. Vinter is a decorated officer, with stints commanding the Givati Brigade and the elite Duvdevan counterterrorism unit. However, Vinter's once-promising military career came to a halt after he controversially told Givati Brigade soldiers doing 2014's Operation Protective Edge that they were going out against the "the terrorist Gazan enemy that curses, reviles and insults the G-d of Israel." Vinter's letter caused a media storm, with many alleging that he had improperly mixed religion into the IDF. Ever since the incident, Vinter had been repeatedly passed over for promotion.